Do we have to say "no" to more babies? Late Thursday afternoon when Ian and I had just arrived back from Johannesburg (Ian had flown in from a trip to the US) I got a call from a Social Welfare Officer in Mbabane. She said she had a baby who needed our help and asked if could I drive there right away? Thankfully Kenny and Amber were already in Mbabane and Shongwe was in Manzini so the three of them were able to go and pick up baby #77, who we are calling Moses. We are told that Moses’ mother died in childbirth (as did his twin) and right after the funeral the father ran away and hasn’t been seen. Moses was left in the hands of his 16-year old sister, who dropped out of school to care for him. There were three other younger siblings as well and the children were suffering terribly. In fact, Moses was a year old (born on September 15, 2013) and had never tasted milk or formula – he was living on maize flour since birth. When Moses arrived at El Roi he was given a bath, which is the first thing that is done to get the child clean and give him a quick “look over”. Imagine our surprise to find that this child has 14 fingers and 16 toes! None of us had ever seen anything like that before, but alas, we love him just the same and will get council on if and how surgery might be needed. The next day Ian and I were in town picking up the Egg Farmers of Canada, who flew in to discuss a new partnership with them to help us provide healthy egg protein to the 3,500 Orphans and Vulnerable Children that we feed each through our church partners each week. During lunch I got a call from a new Social Welfare Officer (in a region we have not worked in before) and she begged me for help. An hour later I found myself in the Commandant’s office at the Women’s Prison in Swaziland with the four men from the Egg Farmers of Canada. We heard a story that required true grit to not break down sobbing in the office. A 21-year old girl sat in front of us holding two babies. The girl was in prison for the attempted murder of her 6-week old baby girl. 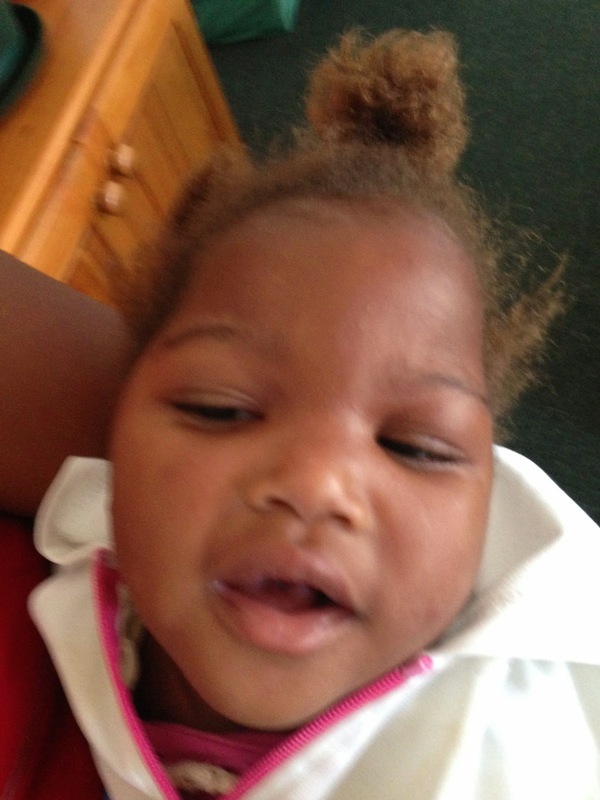 At 11PM on September 11th, 2014 she gave birth in an outdoor pit latrine/toilet to the baby and went back to bed. At 5AM she went back to see if the baby was dead and heard that the baby was still alive so she went and got a bucket of fire and threw it in on the baby to make sure the baby died. Her Uncle heard the cries of the newborn and ran to the rescue. When he looked deep down in to the pile of stinking human waste he saw the newborn baby on fire. He quickly grabbed a shovel and threw dirt in on top of the baby to douse the fire. 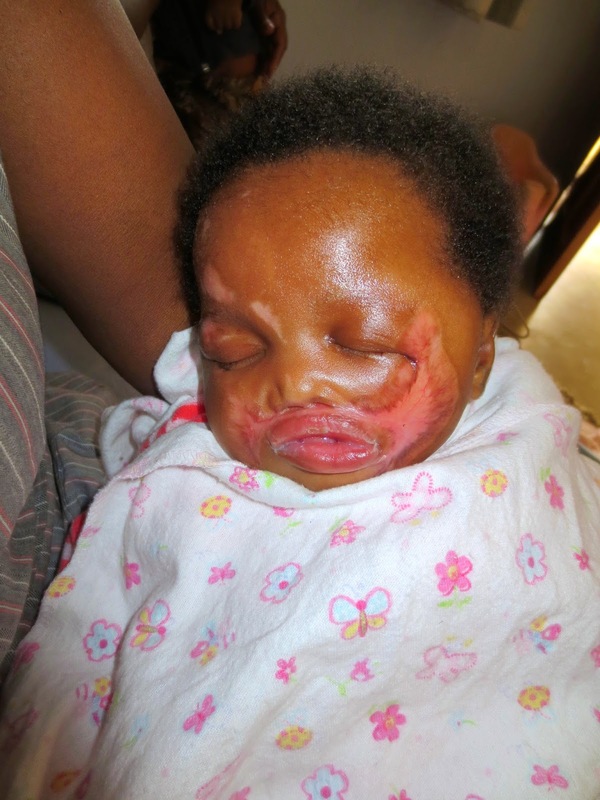 Both mother and baby went to the local hospital for five weeks and the child is left with significant scarring on her face, arms and legs. The second child is 16-months old and had a seizure at the age of 6-months leaving her with some paralysis on the left side. But ironically, she ended up in the hospital with her burned sister and received some Physiotherapy and now has much more use of her arm and leg. The child is severely malnourished and the orange color of her hair is only one indicator of that malnutrition. Both babies came home with us on Friday, wrapped up in the loving arms of our Canadian friends (Peter, Tim, Roger and Scott). The mother will stay in prison awaiting her trial. We are calling the small baby Shirley, and the older one Rebecca. Peter, Tim, Roger and Scott from the Egg Farmers of Canada. 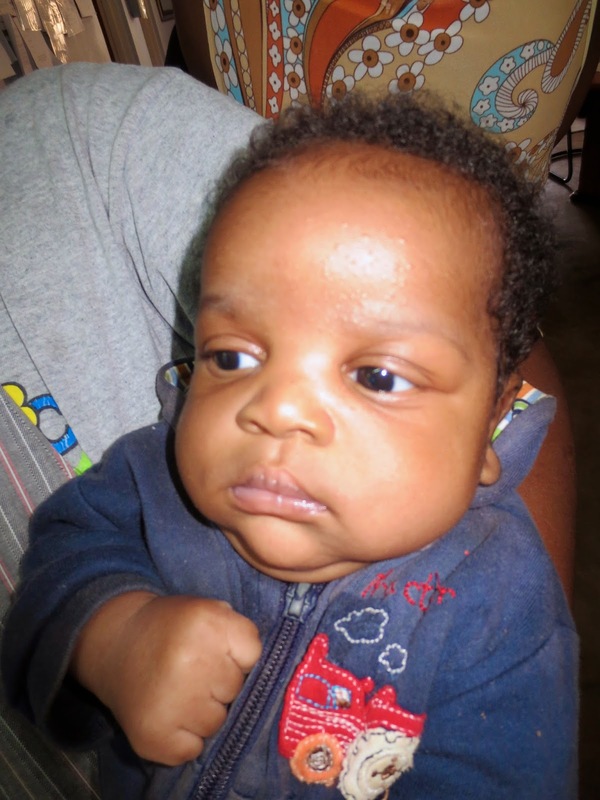 All week we had been in conversations about another baby boy whose mother had been sent to Juvenile Remand by her father, and then found out she was pregnant. The child was born inside the Juvenile Prison and then handed out the front door to the Grandfather. He did not want, or couldn't care for a newborn so gave the baby to the alleged father from Mozambique. The father had no means to care for the baby (baby is being treated for HIV because the mother is HIV positive) and we were asked to take the one-month old baby before he was dumped. We were unable to get to that baby on Friday, so I promised to go back to Manzini on Saturday morning and pick up the baby and the paperwork. Saturday morning I woke up completely overwhelmed. Ian and I sat drinking our coffee and realized that today we would receive Baby #80 and that we were MORE THAN FULL at the baby home. There is still room at the toddler home, but the baby home would have 45 babies in it (built for 20, but then double stacked cribs allowed for 40). We talked about having to say “no” to the next baby. Not to mention we do not have the monthly funding for the last 7 babies who have come to us. I wasn’t sure how I would be able to say “no”, knowing that we might be the only hope that the next baby would have for survival. I left the house very disturbed and unsettled. At 8AM I left to pick up Tim and Peter to head to town to get Baby #80. We NEVER get babies on the weekend because the government offices are closed, so this was a first and an exception to the rule. As I drove off the farm I received a phone call from the head of the Child Protection Department of the Police. He said the police had a 1-month old baby boy and the mother of the baby was insane. She was trying to harm the baby and would often leave the baby alone for days. Could I please go and meet the police and take the baby while they take the mother to the National Psychiatric Hospital? It as as if God was laughing at me and saying, "I am the only One who gets to say "no". First we went and picked up the baby we were initially asked to get, whom we are calling Souza, born September 11, 2014. After doing what needed to be done we drove to meet the police at the Psychiatric Hospital. I can’t even begin to describe what the inside of that hospital with 300 patients is like. Lots of screaming, crying, singing, howling and even barking. There was one women who saw Tim and I and starting singing, clapping and calling, “Mommy! Daddy!” Then she proceeded to take off all her clothes and dance for us inside her secured room. (A blog for another day). Baby Quinton (named Queentin by his mother). Born September 16, 2014. The Police will follow up with the Social Welfare Department, but as of today we are responsible for 81 little lives. I have no idea how we will pay for them each month, but I believe that the Lord will provide. I have no idea how we will get medical care for Baby Moses’ hands and feet or for the surgery for Baby Shirley so that she can properly breathe through her burned nose and see correctly out of her left eye, but Jesus knows. And today, overwhelmed and frankly, tired, I leave it at the cross. We have 38 children in the Toddler home (Daniel and Eve moved up today). 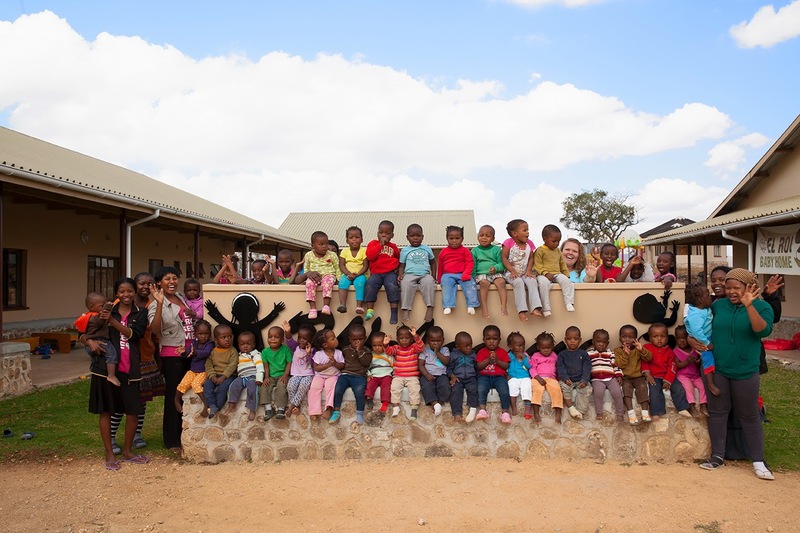 There are 28 living in the baby home and we have moved all 15 “tiny” babies (under 6-months) up to Kuthula Place. It’s a full and busy place, and we give thanks. 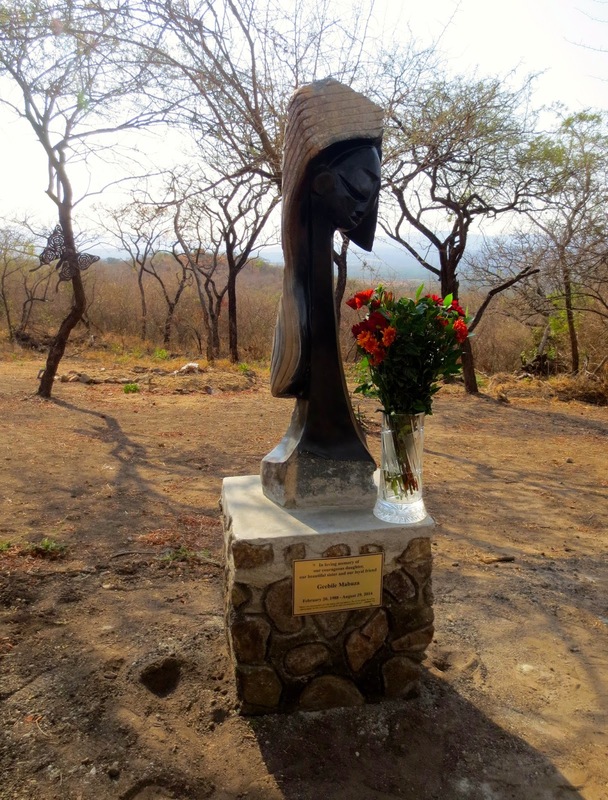 Live from Swaziland … I had to nap before writing this. If you can help on a monthly basis, please do so. $55,000 USD literally blew away. I did not grow up on a farm, but I always felt great empathy when I would watch the news and see farms wiped out because of not enough water, or too much water, or too many insects or even a hail or wind storm. I saw the despair in the eyes of the farmers, but it was not until this week that I felt that first hand. On Thursday night as I was letting the dogs out of their pen I looked up at the sky, pulled out my phone and took a photo. It was black and luminous, and while I LOVE a good storm (especially sitting on my patio in Africa! ), the sky didn’t tell me that a friendly storm was on its way. I quickly finished up outside and only minutes after I got inside did the rain start coming in horizontally, across a 15 ft verandah/patio, to our glass doors. Seconds later our heavy, teak patio furniture was flying across the deck and on to the ground, only to be plummeted with large marble sized hail. All six dogs were freaking out and desperate to get inside, and all ran past me when I opened the door to let the little ones in. I am a journalism major so am usually quite quick to take photos of things happening, but also Ian is in the US this week so I needed to take photos because he might not believe what I was seeing. The storm lasted about 30 minutes and then the rain subsided. Amazingly the electricity was still on and our phones worked. I sent a message out to all the supervisors or building representatives on the farm to see if everyone was okay. It seemed there were no human injuries so I called William to meet up with him to assess the situation on the farm. By the time I reached the bottom of our mountain I met Stanley (our Farm Manager) and the Farm Supervisors. They all shook their heads at me and said, “Janine, the crops are all gone”. Now, when they said “gone” I thought they meant “destroyed/broken/unrepairable”, but they really mean “GONE”, as in the “blew away”. The sun had gone down and another storm was forming quickly so William hopped on the back of my ATV and we went up to check the baby and toddler home. There were six broken windows in the baby home and three broken ones in the infirmary, where we had four sick babies at the time the storm hit. Thankfully, no one was injured, even though the whole infirmary is covered in broken glass. Thank you Jesus for your protection. Torrential rains started, I drove William back down to the farm then headed back up to our house. I was absolutely drenched when I finally got inside and I even had 2 inches of water INSIDE my rubber boots. I was a sight for sore eyes … but I don’t think the dogs noticed. Early the next morning I drove around the farm to get a more thorough report to send to Ian, and our Board of Directors, who are having their Annual Board meeting this weekend. The dairy and cows were unharmed, in fact we even got a new calf the day of the storm. But the fields were bare, as if they had never been planted. We have been doing rotational crop farming so that we always have crops being planted and always have vegetables being harvested. This allows us to provide year-round employment for 100+ people just through the agriculture program on Project Canaan. Friday was a dark day, and when the workers arrived at work, 70 of them were told that we didn’t have any work for them because there was nothing to pick. Up until Thursday night we had been picking literally tons of green beans every week and we were just ready to start harvesting our mini-vegetables (zucchini and squash), but now there was nothing to pick, and the “pickers” were sent home. Each of those 70 workers is responsible for at least 13 dependents at home, that means a minimum of 910 people may/will not have food until we have crops ready to pick again in 4-6 weeks. On Thursday night, in 30 minutes, $55,000 USD blew away on Project Canaan, and there was nothing we could do to stop it. On Friday the workers who kept their jobs started pulling up all the drip irrigation tape so that the land can be ploughed and we can start planting again on Monday. The cost just to replant all of the fields is more than $11,000 USD, but the bigger loss is the profit that we would have generated by selling the vegetables – with 100% of the profit that goes DIRECTLY back into buying baby diapers, baby formula, providing care for our 76 abandoned babies. Our goal is to be self-sustainable by the year 2020 so that we can provide all that is needed to run Project Canaan and the Children’s home, without outside help. We want to be able to provide for ourselves, but this week it seems that we took two steps forward, and three steps back. Now, that being said, I am a firm believer that ONLY God can make it rain and only God can make hail. For that matter only God can make a green bean or a mini-zucchini. He has provided all that we have to this point and each and every time we have been in need, HE HAS provided, often even before we knew we were in need. He is El Shaddai, and we give thanks. In fact, 1 Thessalonians 5:18 in the Message bible says, "Be cheerful no matter what; pray all the time; thank God no matter what happens. This is the way God wants you to who belong to Christ Jesus to live." Sheesh! I won't lie and say that I do that all the time, but when I know that ONLY HE could create the weather that took away that income generation both for Project Canaan and for our workers, I choose to give thanks for how HE will provide. I don't know how He will do it, but I know that He will. 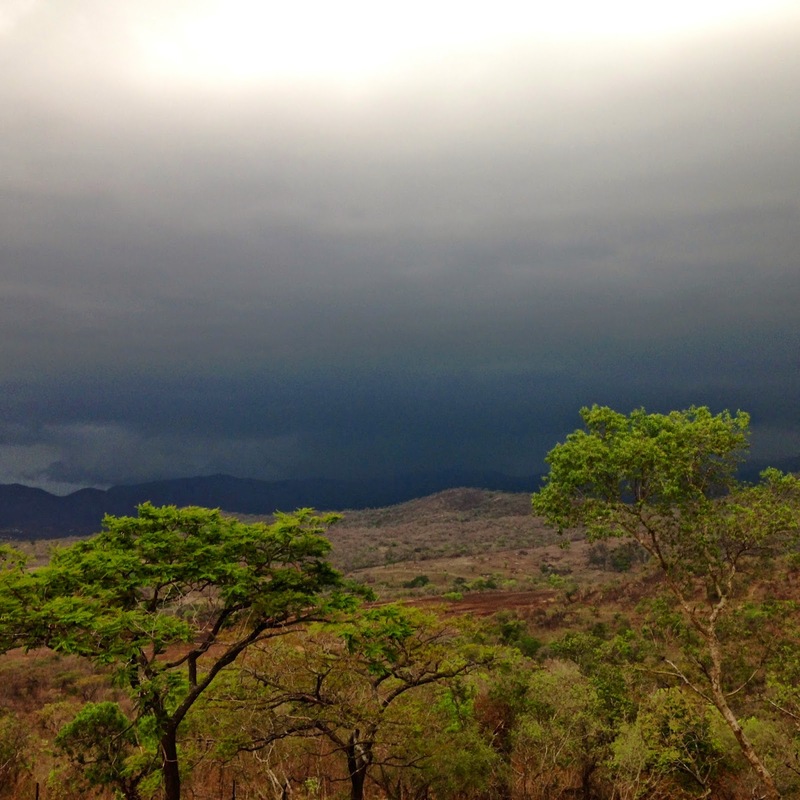 Live from Swaziland … I will praise Him through this storm. PS – If you are able to help us with rebuilding our crops and helping us provide for our children we would greatly appreciate any assistance you can give. In the US please give here. Please put "Farm Emergency Fund" in the comment section. Some days even I think we are crazy – 76 babies and counting. Every now and then I find myself sitting on the couch at the end of a long day with Ian and I am completely overwhelmed at what we have been called to do. That happened this week when we got our 5th set of twins. Yes, 13% of all our children are twins (two fraternal, two boys, one girls). We now have 76 children, under the age of 3.5 years, living at Project Canaan and we get a baby on average every 12.5 days. Fifteen of our children are under the age of 6-months (! ), seven are HIV positive and many are underweight and/or developmentally delayed (often those two things are directly linked). 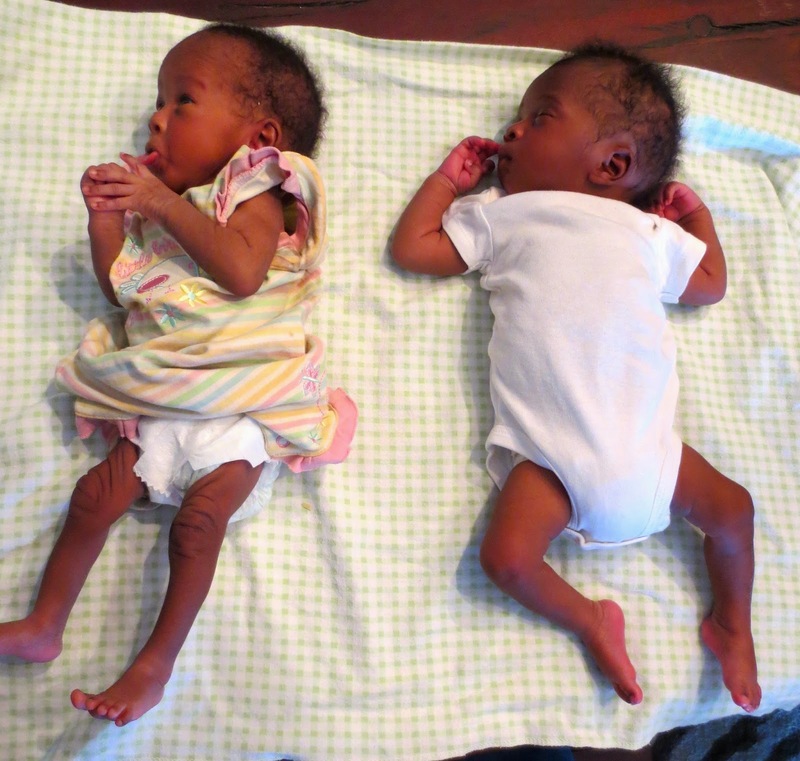 Two weeks ago I wrote a blog about a set of twins that we found out in the rural community. You can read the details at http://janinemaxwell.blogspot.com/2014/09/you-just-never-know-what-is-going-to.html. On Friday, October 3rd I picked up Lori Marschall and Janice Johnson at the airport and then headed straight to Siteki to pick up a baby (Eliza) from the hospital. As it turned out we were asked to take two babies that day and after the paper work was done and babies fed we headed back to Project Canaan. On our way home I got a call from the mother of the twins in the blog noted above. She was crying because she and the baby girl had been discharged and she still didn’t have any money to pay to get out or take a bus home. Somehow the hospital didn’t have record of the $32 US bill I had paid the week before and now she owed another $8.70 US for her and her baby’s 5-day stay at the hospital. We stopped in, cleaned up the confusion and the bill and gave her bus fare to get her home. We promised to bring the male twin to her on Monday with the police, as they were the ones who took the baby in the first place. We had a team of people here this past week so I tasked Helen and Shongwe to go to the police station and get an officer to go with them to return the child to the mother. Two hours later they arrived back at my house with both twins (!). What? Yes, they found the mother lying on the ground outside and the baby alone inside. She was no longer breast-feeding and there was no formula so the baby was only being given water. 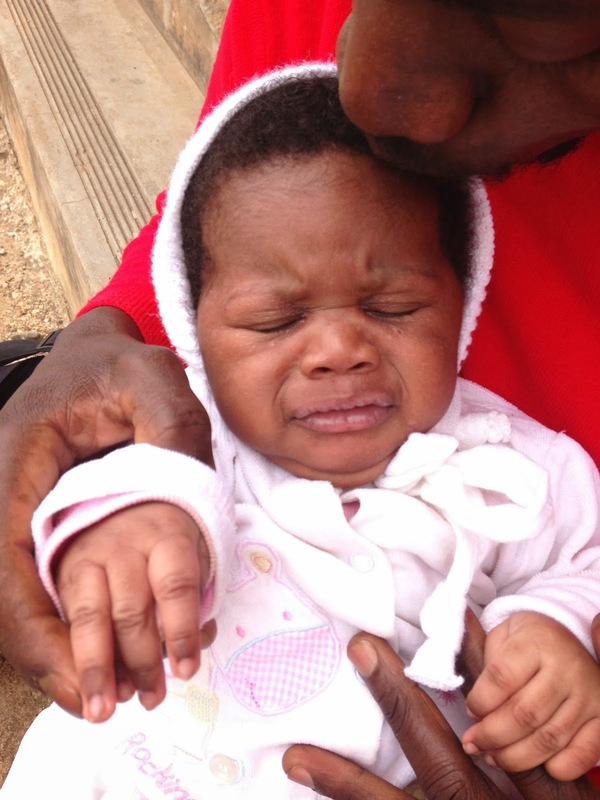 She was almost down to her birth weight (4.1 lbs) at 3-weeks old and it was clear that she was dehydrated. The 21-year old mother also has a 4-year old and a 5-year old (who was recently raped by her Uncle) and did not want these babies at all. The alleged father of the babies has turned off his phone and has not been in contact with the mother since she first told him she was pregnant. Photo of "Robert" being returned to his mother. I am told there were several phone calls between the police and the Social Welfare officer and the mother and finally Helen and Shongwe were asked by the family and the government to take the children – a report, paperwork and a court order would follow right behind. Bernice and Robert arrived at Project Canaan. Some of you are wondering why we would do this? Why wouldn't we try to help the mother instead of taking the babies? And those are valid questions. There have been cases where we did invite the mother and children to live at the Kibbutz so that they could stay together. This situation presented itself differently and sometimes we just have to go with our “gut” and rely on the wisdom and background knowledge that the officers involved are aware of, even if it is not shared with us. We have named the babies Bernice and Robert. They were born on September 15th, which is the same birth day as my Mom (Bernice Willis) and that is also Ian's birthday. Robert Smucker was with us on the day we first found the babies so we have named the boy Robert in honor of our dear friend, and brother Robert Smucker. That night I was overwhelmed. So many little mouths to feed (150+ bottles per day alone), so many diapers to change (400+ every day), so many children to provide for and love for life. There are so many moving parts here, so many operational challenges, staffing challenges and funding challenges. Ian is landing in the US today for the Annual Heart for Africa Board meeting, so I have a couple of weeks alone here on the farm. This morning in my quiet time I watched a video that was released by the Egg Farmers of Canada yesterday http://youtu.be/8MuEzmmhM1E about Heart for Africa and their partnership with us. It was so great to see the faces of our children, but also all the faces of the Swazi’s who are here caring for the babies and volunteers who come and help. As I watched I saw the farm workers, the dairy workers and the Khutsala Artisans and knew that they are all a direct part of helping us with this daunting task. Then there are the Egg Farmers of Canada themselves who are coming to help, and the US Bank and UPS people who were just here helping, and there are more people on their way. These are God's children and He is their Father - He must send the people and we pray that those who are called will say "yes". 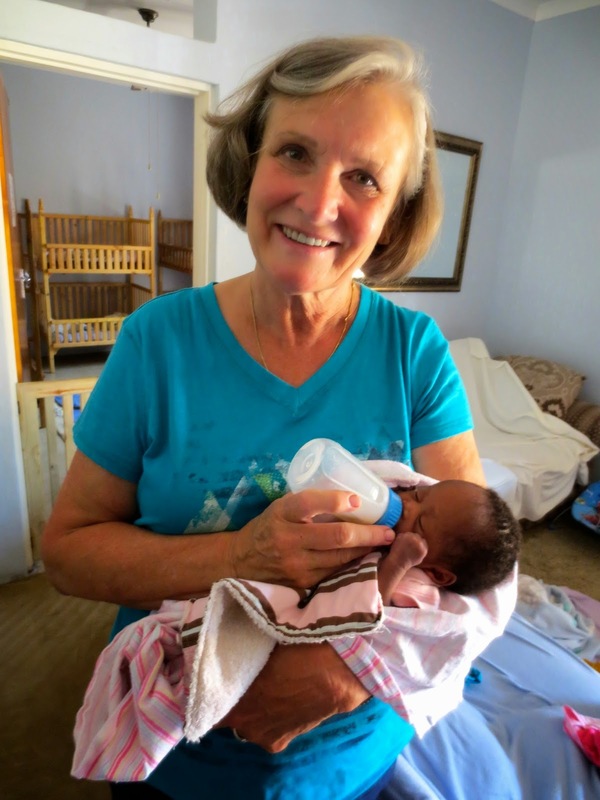 Jan Bechtel - Long term volunteer feeding Bernice. We are not in this alone and we are not called to do it on our own. It takes a village to raise a child, and these children are being raised by a global village. There are days that even I think we are crazy, but maybe “crazy” is a good thing under the circumstances? Thank you for your prayers and support. We do need financial support for the last SIX children who have come to us in the past month so if you would consider becoming a monthly donor we would very much appreciate your direct assistance. Live from Swaziland … this is a busy place. You want to do what??? This past week I got a call from a woman whom I could barely hear and who said she wanted to come see me about some children. It seemed that she had children in her care whom she wanted help with, but I told her that she must go through the Social Welfare Department before coming to Project Canaan. But she pushed, in fact she demanded a meeting with me and her forcefulness was surprising, and seemingly un-Swazi, but because it was so unusual I agreed to meet with her for a short visit on Saturday morning. The lady arrived at 10AM sharp, and when I met her at the gate I found a Gogo, two middle-aged women and a man who said we had met before. He did not look at all familiar and I didn’t know why all four were there. When they told me who they were, and I felt like I had been hit with a 2” x 4” from the side and didn’t see it coming. That Gogo was the Mother to the Father of Nomsa’s twin girls (!!). The man was Nomsa’s Uncle (her mothers’ brother) and then the two women with her were his sisters (I think Nomsa’s Aunt’s, but could be something else as he introduced them as his sisters not Nomsa’s Aunts). They had come for several reasons, which I would not find out until later in the conversation, but they started by thanking me for all the help we had given Nomsa over the past two years. He also danced around the notion of us not attending Nomsa’s burial that there was disagreement as to where she was to be buried, and then there was a pause. It seemed as though there was more to be said, but standing at the front gate was not where it was to be done. We don’t have an office at Project Canaan so, maybe against my better judgment, I took them to the baby home to sit out back under the shade where there is a picnic table. I sent a cryptic message to Ian to come and join me, and he did. If he had not, the day may not have ended the way it did. After a repeat of the conversation at the gate (“thanks” and “sorry”) they dropped the bomb. They were there to find out how to get Leah and Rachel and take them back to the family. The Gogo (again, for emphasis, she is the Mother of the FATHER of the babies) wanted the girls and had come to claim them. I asked where the father was and they said he was working. I reminded them that he had never laid eyes on his twins and I asked (as politely and graciously as I possibly could) why the family didn’t want to help the twins when they were dying of hunger and malnutrition on a mud floor while their mother lay dying beside them of MDR-TB? None of the Father's family had every seen or met the twins and none had gone to visit Nomsa in the hospital. Why would they want to now come and take the babies in to their home?? They started to give an explanation of how sometimes children don’t share with their family what is really going on, they tried to say that they really didn’t know about the twins until recently and that they were ready to take the girls home. Yes, that is a direct quote. While my brain was madly trying to process what was being said to me, and my mouth was trying to stay closed so that I would not say anything that was inappropriate, offensive or that I would regret later. Ian jumped in and was my knight in shining armor. He gently explained how this home is under the Deputy Prime Ministers (DPM) office and how it is run. He explained that all of the children who we are for are placed with us through the DPM’s office and we are under their authority. Court orders are given for each child and if they wanted to appeal the court order they would need to do that before the girls would leave. He then offered to take them through the baby home (where we have 39 babies with a capacity of 40), then on to the toddler home where they could not even identify which children had belonged to Nomsa (because they had never met them!) and then on to the preschool where the girls would learn to read and write. Ian then offered to take them to Nomsa’s House where she lived up until the last 4 days of her life. He opened the room, which I have not been in since she passed away, and showed them the large “Welcome Home” sign that was still on the wall with the hand and foot prints of her twin girls. All four of them walked out of the home shaking their heads. I was not sure how to interpret that. We moved on to show them the new Kindergarten that is being assembled/set up by our WLA friends from the US Bank today, and they were greeted by everyone who was preparing that incredible place of learning for Leah and Rachel, and all their brothers and sisters. All four of our visitors wept. They walked slowly to their cars and then hugged us, thanked us and prayed the Lord’s blessing over us, then left. My prayer is that I can honor my promise to Nomsa and raise Leah and Rachel to the very best of my ability in the safety of Project Canaan. After we went back to the house and had a complete meltdown at the thought of losing those beautiful twins, Ian reminded me that they are His children, not mine, and that I must trust Him in all things. That is not always easy, but it was a timely reminder from my best friend, and husband of 23 years tomorrow, October 5th. Happy Anniversary Ian, and thank you. Live from Swaziland … trusting.